Savvy Spending: Kmart: Free ITEM of your choice with Text! Kmart: Free ITEM of your choice with Text! Kmart is offering a FREE item of your choice when you text DEALS to 56278. 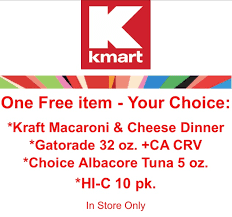 Choose from a free Kraft Macaroni & Cheese Dinner, 32oz Gatorade Bottle, Albacore Tuna or 10-pack of Hi-C. Limit one per customer. You'll be subscribing to receive text alerts from Kmart but you can opt out at any time. Valid through May 5, 2018.